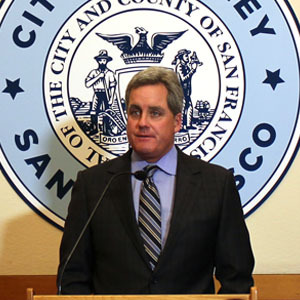 SAN FRANCISCO (April 24, 2018) — City Attorney Dennis Herrera announced today he has asked the court to remove 34 of 42 people covered by a civil injunction that had prohibited members of three violent street gangs from engaging in gang-related nuisance activity in specific parts of the Western Addition. Herrera filed a motion today asking the San Francisco Superior Court to modify the Western Addition injunction to remove individuals who were no longer engaged in criminal gang activity. In the years since the injunction was put in place, many of the named gang members have quit their gangs. One of the gangs, Knock Out Posse, crumbled and is now no longer an organized gang. Herrera is asking the court to update the injunction to reflect those realities. While the Knock Out Posse gang has disintegrated, the Chopper City and Eddy Rock gangs are still active. But their membership has changed as older gang members have “aged out.” Of the 42 men originally named in the Western Addition injunction, four have died, 30 are no longer engaged in gang activity, and eight remain on the list. The injunction does not cover newer members, so the total membership of both Chopper City and Eddy Rock is larger than the members enjoined. The City Attorneys’ Office is seeking to modify the injunction as part of both an internal review and an evaluation requested by elected officials like Supervisor Sandra Lee Fewer. The City Attorney’s Office is in the process of reviewing the other three gang injunctions, which cover gangs in the Bayview-Hunters Point, Visitacion Valley and Mission neighborhoods. All four injunctions could receive additional updates. The Western Addition injunction was one of four civil injunctions brought against seven street gangs from 2006 to 2010. An internal review of arrest data by the San Francisco City Attorney’s Office shows that the gang injunctions have been effective. In 2007 each gang member enjoined had significant criminal and nuisance conduct in the months and years leading up to the imposition of the injunctions. Four years later, in 2010, 46 percent had not been arrested for anything other than minor violations of the injunction itself. The latest review shows that more than 75 percent of the Western Addition members are no longer engaged in criminal gang activity. Gang injunctions are a tool used to curb criminal and nuisance behavior within a designated area, a “safety zone,” which mirrors the gangs’ turf. Herrera has used civil injunctions to prohibit identified and documented gang members from engaging in such conduct as trespassing, intimidation, graffiti vandalism, gang recruitment or retention tactics, displaying gang signs or symbols, or associating with other gang members under most circumstances within the “safety zones.” The injunctions additionally prohibit gang members from possessing drugs, graffiti implements, guns and other dangerous weapons within the safety zones. Gang injunctions, however, are not stay-away orders. They do not restrict anyone, including enjoined gang members, from living, working, going to school, or otherwise being present in the safety zones. San Francisco’s gang injunctions have notable differences from other gang injunctions used across the state. San Francisco’s injunctions did not attempt to enjoin an undefined group, and they have never given unilateral authority to police officers to designate someone as a gang member. San Francisco’s injunctions name specific individuals with well-documented criminal activity; they do not simply apply to any member of a particular gang. The injunctions only cover adults and do not incorporate any criminal activity as a juvenile. There is also judicial review every step of the way. Only a judge can apply the injunction to someone, which occurs after a hearing and due process where the court determines the person is an active gang member engaged in extensive gang activity. Those individuals received notice of the court action and had the opportunity to address the allegations. The City Attorney’s Office went to great lengths to ensure that the individuals enjoined had the right to contest the allegations against them. Additionally, San Francisco offers an “opt out” process by which individuals named in civil gang injunctions may petition the City to be removed from it. That provides an opportunity to have the injunction lifted for those no longer engaged in gang activity. Enjoined individuals can also file a motion in court to be removed from the injunction. The case is: People of the State of California v. Chopper City, Eddy Rock and Knock Out Posse, San Francisco County Superior Court case number CGC-07-464493, filed June 21, 2007. More information on gang injunctions can be found on the City Attorney’s website.